10 Fall Allergy Remedies from Milwaukee Duct Cleaning Company. There are over 50 million people in the U.S. who suffer from seasonal allergies. The team at Capital Heating & Cooling created this list of ways you can reduce the amount of allergens in your home this fall. Read on and learn how you can reduce sneezing, wheezing, and coughing and make your home a haven from all those irritants outside. Forced air HVAC systems use duct work to guide heated or cooled air to various rooms throughout your home. So naturally it makes sense that when you turn your heating or cooling system on, allergens and airborne contaminants are also guided swiftly into your home. And, over time, those particles build up inside your air ducts and the cycle repeats itself again and again, and again. You get the picture. So, will duct cleaning help allergies? Professional duct cleaning services use commercial grade duct cleaning equipment to thoroughly clean and remove the buildup of allergens like dust, debris, and other contaminants from inside your air ducts. Sealants can also be used to prevent future buildup inside your air ducts. Watch this duct cleaning video to learn more about what to expect. 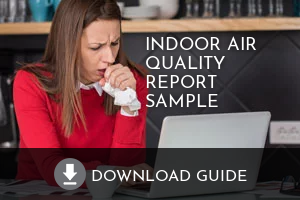 An indoor air quality audit takes the guess work out of choosing the correct HVAC products or services to relieve your allergies and improve the air quality inside your home. A high-quality furnace filter is your first line of defense against poor air quality in your home. The right filter can turn your HVAC system into a “whole home” air filtration system. Choose a furnace filter with a MERV (minimum efficiency reporting value) rating of at least 13 – the higher the MERV rating the better. The filter traps particles like allergens, pollen, and mold, before they make it into your air ducts and eventually out your vents and into your air. Be sure to check your furnace filters regularly and replace them as needed. Most standard furnace filters need to be replaced at least every three months. When choosing a furnace filter, keep the above MERV ratings in mind. For those serious about asthma and allergies, a home air purification system is a must. While there’s many types and brands of air purifiers to choose from, industry experts recommend a whole-home air purification system that can be installed into your existing HVAC system. Whole-home air purifiers improve air quality by treating the entire home as a system, by improving the efficiency and cleanliness of the air handling system itself, and by constantly monitoring and managing the air flow in the home. 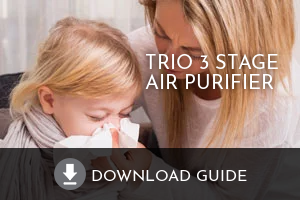 The top performing air purification systems include Field Controls Healthy Home Duo and Trio. The Trio is a 3-in-1 package that removes 93.6% of particles in just two hours, keeping the air in your home fresh, clean, and pure. Contact Capital Heating & Cooling for more information on the Field Controls Healthy Home Trio, a product brochure, and to take an air quality survey. How does it work? As air enters the Trio, a 4 inch MERV 13 filter traps the harmful particles like dust, pollen, etc., then passes through an ultraviolet C (UVC) germicidal treatment zone guarded by two powerful 24″ UVC germicidal lamps that neutralize airborne microbes such as bacteria, viruses, mold, and fungi. The final phase uses a patented pro-cell technology to transform odors and volatile organic compounds (VOCs) into harmless, odorless water vapor and carbon dioxide. Indoor air that has too much moisture creates a breeding ground for allergens like mildew, mold, dust mites and bacteria. But, not enough humidity can dry out and inflame the mucous membrane lining your respiratory tract, increasing your risk of colds, the flu, and other infections. Flu viruses survive longer, and spread more easily, when humidity levels are low. The American Academy of Allergy, Asthma & Immunology recommends keeping indoor humidity below 50%. A whole home humidifier with an automatic stat will ensure the humidity levels in your home are automatically adjusted. Using a vacuum cleaner with a HEPA filter will reduce dust, pet dander and other allergens. Remember, vacuuming temporarily stirs up dust that takes a couple of hours to settle back down. Do not permit smoking in the home at any time. During the height of pollen season, reduce the amount of pollen you’re tracking into the home on your shoes or clothes by either removing your shoes or using a tracking mat at the door. Groom your pet outside your home to cut down on the amount of pet dander in the air. Wash your pet’s bedding regularly. Scrub bathrooms, basements and other tiled areas to cut down on the potential for mold to grow. For the 50 million seasonal allergy sufferers in the U.S, we hope you’ve found these tips helpful and have a healthy fall season! Have questions about air duct cleaning, fall allergy remedies, or want to schedule an installation or air quality audit? Contact our Milwaukee duct cleaning company online or give us a buzz at 414.384.4822.